Who: This is me, Jaimee, and little Lyra Snow. Our little family went on a big road trip with 3 month old Lyra. Not pictured is my husband, Asa, as he was our photographer. Where: We drove from Seattle to San Francisco along the Oregon Coast in a rented Toyota Yaris. We stopped for hikes and walks all along the way. 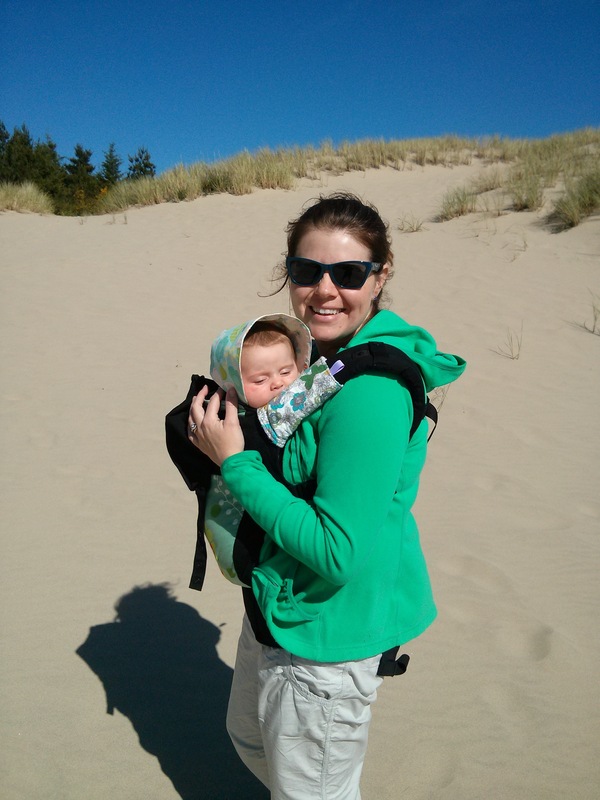 We are big fans of the National Park system so couldn’t resist a stop at the Sand Dunes in Oregon. You can’t bring a stroller here!!! But no matter, because we didn’t bring it at all on our vacation, knowing that Lyra would love to be carried after her jaunts in the car seat while we drove along. What: Lyra is in the Boba 3g with kangaroo on the front. She has loved this carrier since she was a new baby! We love it because we can both wear it without any major adjustments, making it the perfect thing to bring on a vacation where storage space is limited! One carrier, two parents, simple and perfect! When: This was the beginning of June for a late morning hike in the sand. Why: All parents need a few hands-free moments during the day, for balance, stability or just a little more sanity. Sometimes my timing doesn’t mesh with Lyra’s equally important need for snuggles. Lyra loves to snuggle into me and even starts to coo and squirm when she see me buckle the Boba on everyday for our walks or when we need to get some work done around the house. Its the cutest noise and I love that we are both getting just what we need in that moment! Yay, amiga!!! So happy to see you on here!